Oval Address Plaque personalized address sign made from real crushed stone and resin. 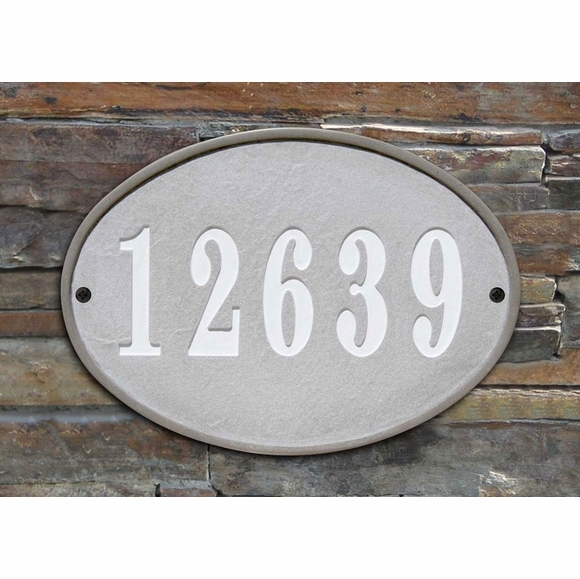 This UV / weather resistant address sign features a rich stone textured background with polished border. Plaque comes in either sandstone or slate finish. Engraved characters in your choice of black, white, or mocha finish. Mounting hardware included. Optional lawn stakes sold separately, item 71731F, see Related Products area at right. Dimensions (approximate): 10"W x 14"L.